Important new Plunkett insights and data on Consumer Products & Services - Plunkett Research, Ltd.
Plunkett Research has launched terrific new insights on consumer products and services of all types. 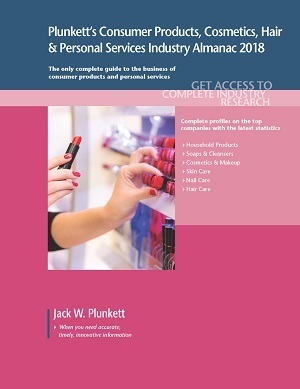 This new data is now available at Plunkett Research Online, and in a brand-new book: Plunkett’s Consumer Products, Cosmetics, Hair & Personal Services Industry Almanac, 2018 edition. Consumer products and services are an ingrained part of everyday life and important industrial sector. At Plunkett Research, the consumer products industry includes household products, soaps and cleansers, cosmetics and makeup, skin care, nail care and hair care. Also, we consider a wide range of businesses to be in the consumer services sector, including pet care; nail and hair salons; spas and massage services, and many other types of personal services. Plunkett Research estimates the U.S. market for barber, hair, beauty and nail salons, as well as diet centers, spas and similar personal services, at $70 billion for 2018, to grow to $89 billion by 2024. The global beauty products and personal care products market is estimated at $450 billion. We estimate U.S. Cosmetics, personal care and household cleansers manufacturing industry revenues at about $95 billion for 2018, growing to $124 billion by 2024. While mass-market retailers, including discount stores, department stores, drugstores and supermarkets, are major sellers of consumer products, there are also a considerable number of specialty stores, including the Ulta chain of beauty and skin care products, as well as its competitor Sephora. Plunkett Research estimates the specialty cosmetic and beauty supply store industry in the U.S. at $15 billion for 2018, growing to $19 billion. This entry was posted in News on March 9, 2018 by NOTadmin.